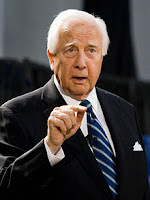 An Urban Teacher's Education: Dear David McCullough: I Respect You, But HOLY COW How Could You Forget Testing?! Dear David McCullough: I Respect You, But HOLY COW How Could You Forget Testing?! This evening 60 minutes aired a major feature on the famous historian, David McCullough. It originally aired last November, but I didn't see it until tonight. For the better part of the show, it was mostly an interesting examination of American history and the role it plays in our lives today. But there was one part of the show when David McCullough talked about how disappointed he was with our youth's historical illiteracy. As an example, he spoke about a student he met at a midwestern university who didn't know that the original 13 colonies were on the East Coast. Good points. But good lord, Mr. McCullough, you left out THE most direct contributor to many of our students' growing historical illiteracy: high-stakes testing. Now, I've got to say, I take personal offense to Mr. McCullough's charge because I'm a history teacher. I majored in history, and I'm far from a lackluster teacher. But in more than one school I've taught in, I've been directed away from teaching history in the name of preparing students for reading and writing tests. Moreover, schools across the country have been eliminating the social studies, physical education, and arts education in the name of preparing for high-stakes testing. Please, Mr. McCullough, continue your campaign for the improvement of history education in our country, and continue your fabulous writing. But next time you get to talk about why our youth is undereducated on national television, PLEASE mention the faults with high-stakes testing. That message needs to be heard by the public as often as possible. Last summer I watched as McCullough gave a grand tribute to teachers just prior to his booktalk at a book festival covered by CSpan's Book TV. Apparently, since then he's taken in some of the kool-aide as have so many of our leaders. Testing is a problem. However, so it time. I teach elementary. Curricula has become so diverse that there is just too much on our plates. Grades one-to-five are a great time to start interesting children in their own history. Do we do it? No. We treat social studies (if we teach it at all these days) by starting with communities and turn it into sort of a science - a hierarchy of me, my family, my neighborhood, etc. Even when a teacher makes it engaging, what does it really serve? I love politics and history but hated the textbook teaching I received in high school. We really need to rethink the whole "social studies" curriculum and bring it more engagingly to the classroom. BTW, Kristin on another blog which brought me to your blog gave an example of one teacher doing just that in Seattle and who has suffered negative consequences for doing so. Bringing history to life can be uncomfortable for some. Unless, of course, you stick to a scanning of superficial bits of information. Really well-said. Thanks so much for your comment. Some teachers do major in education. I believe that's how it works at WSU. I had the same response when I viewed the segment. I agree wholeheartedly.